This book, written by an Australian, Merv Howse, proclaims on the front cover that it is a serious look at the lighter side of meditation. The idea for the book came after a friend of his was diagnosed with a terminal illness, and the book has taken four years to appear on the shelves. It is author Howse’s first foray into writing/publishing, but his background includes stints in advertising and sales and a love of the mystic East, culminating in his introduction to Thailand and the study of Buddhism and meditation through Buddhist practices. I was particularly taken with his description of those who were burdened with alcoholism, and when it was suggested to them that they might try some type of meditation for help, they would say that meditation was just a form of escapism. What was their alcohol, if not just that, says Howse? Point very correctly taken, author Howse! He describes human frailty with an excellent understanding and while reading this book, one gets the impression that much of this has been written from self experience. Perhaps the book is a form of catharsis for the author himself? He does not say. 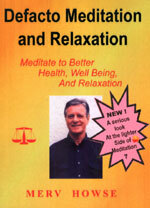 He divides the book into an initial group of chapters looking at the cause of problems, and then follows this with 13 exercises which include confronting one’s fears, stimulating your imagination, getting positive thought processes going, settling yourself with meditative practices and even relaxation and music. The final third of the book reverts to chapter format, and covers health and well-being, verbal etiquette, eating habits, fitness and even making vanity good for you! Thailand does get many mentions in the book, since this country appears to have stimulated the author’s interest in the subject and supplied some of the answers, and even the Pattaya blind massage establishment gets its own mention as being one place where the author goes to unwind. The review copy was supplied by the author, but it is available around town in major bookshops, he assures me. It is a simple book, and as the title suggests, author Howse is not pretending that this is the definitive seminal work on meditation and relaxation, but is an alternative (and easy) way to get the same results, hence the ‘de facto’ allusion. It is not an in-depth work, nor is it one allied to Eastern mysticism either, though it does use the mantra of “I did it. It is done. I cannot change it. I must forget it” throughout the pages. I liked the ‘no frills’ approach to the subject, and I do believe that author Howse has managed to get directly to the centre of the subject. In the author’s words, “The whole purpose of (the book) was not to solve all your problems in one simple course of action, but to lift your spirits and confidence, and gain more control over the way your life is now and how you handle every situation.” For those who are looking for some guidance or feel in need of relaxation therapy, this is an inexpensive primer that just might work. Worth perusing. Having been a long time fan of this wonderful multi-talented band. When their double live vinyl album was released in 1978, it was with great excitement that it was whisked home to my rustic record player. The volume was turned up to ‘unbearable’ and the Dog spent his day listening to one of America’s finest, laying down a live set that would curry a favorable impression with any band on the planet. I happily state that ‘Waiting for Columbus’ should be up there with all the other great live albums of the seventies. But then what constitutes a great live album? It’s clearly not the mere replication of a band’s studio performances. That approach may satisfy the attending audience whilst proving how clever a band can be, although not showing any imagination or creativity. But what’s the point of making a record of one that already exists? It’s far more rewarding to experience a live album on which the boys really get stuck in and show what they can do when released from the confines of the studio, and all the record company ‘suits’ in attendance. Other examples include the Who’s scorching 1970 document ‘Live at Leeds’, where “The Who” were able to show off what an inspiring and exhilarating rock ‘n’ roll band they were outside the confines of hit singles and rock operas, or “The Allman Brothers Band” at the Filmore East, when a band can expand the length of a song searching out every aspect of its outer regions. What makes ‘Waiting for Columbus’ so memorable is that it seamlessly puts all the qualities of a great live album into one neat little package. Upon its first release there was perhaps a feeling of some regret that not the whole of a ‘Little Feat’s’ set could be squeezed onto four sides of vinyl and a three album set would have been welcome, but then we should be happy with what we got. But when it was originally released on the CD format, fans of the Feat really did have cause for grousing, as to fit into the requisite CD formula three further songs were cut from the running list, considered by all to be very unsatisfactory. However, it has finally now been released in a two CD set in its full glory with original tracks replaced, plus the addition of ten wonderful new songs added on with some extra in-between banter from the band. From the warm up cappella that the band ritually used to sing on their way to the stage, to the Country Joe Woodstock style intro, right the way through to the closing jam of final encore ‘Feats Don’t Fail Me Now’, you get it all. As soon as the band hit the stage they lock into the opening groove of ‘Fat Man in the Bathtub’ and you are whisked away to the feeling of belonging that normally only happens on very special Rock ‘n’ Roll occasions, like being in TQ corner on a great night! There are too many highlights to mention them all, but accolades must be given to the ‘Tower of Power’ Horn section that joins the band from the fourth song ‘Oh Atlanta’, where the whole ensemble really begins to cook. An extended version of perhaps the Feat’s most well known number, ‘Dixie Chicken’, when all the members of the band had room to show their talents. Of course, spread like a thick layer of choice caviar every song has its fair share of brilliance from Lowell George, whose sumptuous slide guitar and unique vocals dominate this set. George’s ‘Mercenary Territory’ is probably one of the best live moments of music ever recorded. After a break from the ‘Tower of Power’ Horn section, Lowell George comes charging in right after them, leaving nobody in doubt as to who the Boss is. That is not to say it is just the Lowell George show - far from it. Kenny Gradney lays down perfect bass rhythms adding just the right amount of funk to the proceedings. Sam Clayton’s percussion give the Feat their unique sound. Richie Haywood is one of the busiest drummers in the business. Bill Payne lays down some of the finest all round keyboard work to be heard on any live album, whilst Paul Barrere’s lead guitar work was the perfect foil for the music to hang onto, giving added depth to the band’s forays into the land of jazz/rock fusion like on the nearly fourteen minute long impromptu jam of ‘Day at the Dog Races’. If you like your music live played by slick musicians who like to live on the edge and are not afraid to let go and give it their all, then this could be exactly what you are looking for. Brilliant! It is quite extraordinarily sad that within a year ‘Little Feat’ were no more and Lowell George had left this planet, as many feared he would. But the legacy of music left behind is a fine one with this perhaps being the jewel in the crown. Several years later the remainder of the band reformed under the ‘Little Feat’ banner, but, although they were a popular live attraction, without George the magic had gone.